Advertising through a search engine is a little more complicated than just “highest bidder wins.” A recent Google patent application, a video from one of its inventors, and a couple of older patent applications that he co-authored show some of the complexities that an advertiser may face when wanting to advertise through a system like Adwords. Back in October, 2005, Dr. Hal Varian gave a presentation on the advertising model at Google to a class at UC Berkeley. At the time, he had been working with Google’s Adstats team for approximately 3 1/2 years, as a consultant. It’s a nice introduction to contextual based ads at Google. Dr. Varian is also listed as one of the inventors on number of patent applications from Google describing some of the decision-making processes that may be involved in determining which types and configurations of ads show up on content pages, and the cost of showing ads on content pages based upon ad and document scores. I’ve included links to those, and short introductions to them below. The most recent patent application, published last week, describes decisions on which ads to show on pages. Sometimes auctioned placement alone isn’t the only decision involved. The patent filing describes some of the other considerations. Instead of accepting competing ads and using an arbitration function (e.g., an auction) to choose winning ads to be served with a document, sets of ads (perhaps having different characteristics) can be generated, and an arbitration function can be used to select the winning set of ads. Such arbitrations on sets of ads can consider how ads, search results, colors, positions, fonts, etc., all interact with each other and affect the usefulness of the sets of ads to advertisers, end users, document publishers, and/or an ad serving entity. Documents or document sets may be scored to reflect a value of an action, such as a selection for example, when an ad is served with the document (or a document belonging to a document set). A cost associated with the action with respect to an ad that was served with a document may then be adjusted using the score. For example, ad scores may be accepted or determined, and a document may be scored using the ad scores when served with the document and ad scores across a collection of documents to generate a document score. Each of the ad scores may indicate a value of an action with respect to an ad, such as a conversion rate, or a return on investment for an ad selection for example. Document scores used in this way may help advertisers get a more consistent cost per conversion, or return on investment, without requiring them to enter and manage various offers for various documents and/or various ad serving systems having various conversion rates or returns on investment. Another older patent application, this one also talks about ad and document scores in relation to decisions of what types of ads to show on content pages. (d) serving the selected set of candidate ads. Performance parameter values of ads of one type, such as image ads for example, may be estimated from performance parameter values of ads of a second type, such as text ads for example. I should probably always stress with posts about patents that whatever is said within the patents is only a possibility. In the middle patent application, “Adjusting ad costs using document performance or document collection performance,” they do talk about the difficulties in tracking conversions, especially since a “conversion” can mean many different things to a site that may sell, educate, disseminate information, and generate leads by a number of methods such as contact form or email or phone call. 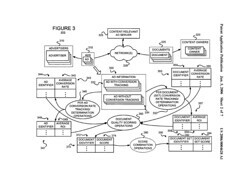 Conversion tracking through something like Google Analytics might provide more usable information upon which to generate a quality score, and some parts of the patent applications discusses the benefits that conversion tracking might bring to a system like this. But, one important thing to keep in mind, especially in this patent, is that it presents a number of “alternative embodiments” that may or may not be used, and it explores those in some detail. There is a difference between a score based upon conversion tracking and one based upon “expected conversions,” and the patent application explores both areas. It’s reasonable that it should. It seems clear that Google treats QS for ads that have Google Analytics conversion tracking differently than ads that don’t. Seems they use some type of ROI factor for QS. This would run counter to what they have said on record and would be big news IMO. Possibly they applied for this in the patent but are not using it? Thanks again Bill for this wonderful information. I’d love to know what you think about this ROI & QS issue. I read the patents, but I don’t know if I got it right. I thought there were several different quality scores for adwords (adsense, minimum bidprice and ranking quality score). In these patents they mention only adsense and ranking quality scores. Is the article I posted wrong? It also says that the ad costs will be adjusted with accordance to conversions to keep ROI consistent, not to get rid of some advertisers. I am not entirely sure, if conversions is the way to judge ads by. It will mean that well managed businesses will gain significant advantage over other businesses. While this will reduce the amount of low quality websites or businesses, it may clearly reduce the amount of mom and pop businesses, who struggle to get traffic and have to pay for it. I do realise that it is a patent application, not a field study report, but still there’s something to discuss, right? These are three of the patent applications that Google has filed paid advertising, but there are a number of others that contain additional information on processes that they could follow. I included the most recent one because it is new, and the other two because they seem most related to it, but there are others that also go into some detail on what Google might be considering when accepting ads, and displaying them. If what you have written is based primarily upon what Google has written in their help sections, tutorials, and articles on adwords, then you should probably feel pretty comfortable with it. The primary benefit that you will likely get out of looking at these patents is an idea of some of the philosophy behind their actions, a sense of alternatives that they might consider using, or may have decided not to use, and a possible insight into something they may do in the future. Specifically, publishers with good conversion rates may end up subsidizing publishers with poor conversion rates in systems in which advertisers enter one offer across all publishers. Publisher subsidies are undesirable because they punish publishers with good conversion rates and reward publishers with bad conversion rates. Over time, a content-relevant ad network that subsidizes bad publishers at the expense of good publishers will attract more publishers with bad conversion rates. This may cause advertisers to lower overall maximum offers per selection over time.